As a result of my amazing trip to Iceland last year I gained a new appreciation for the crazy world of magma and gnarl that makes up the majority of the core of our planet. The fact that it spews out onto the Earth’s surface in the form of volcanoes is a very cool fact, in my opinion. Another cool fact is that one mustn’t venture to the far corners of the planet to seek out volcanoes. If you live in the Pacific Northwest they are literally in your backyard, and laced with sweet singletrack. 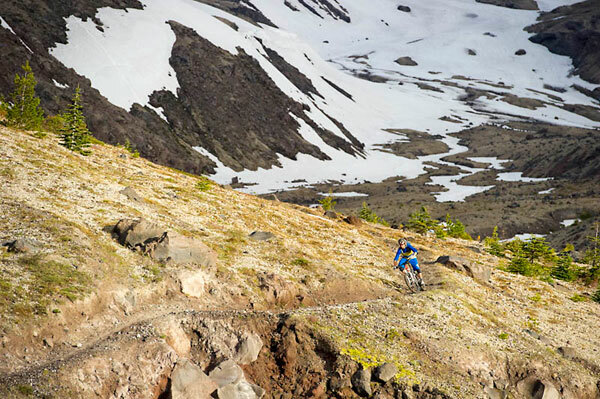 I made the trek down to Mt St Helens to meet up with photographer Colin Meagher to check out some of the buff singletrack in the 110,000 acre Mt St Helens National Volcanic Monument. Not all of the trails in this area are open to mountain cyclists, but there are a few nugs that make it well worth the trip. The area itself is worth visiting, bikes or no. 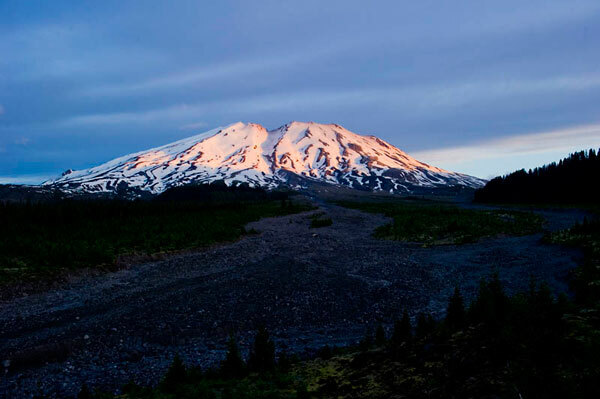 The mountain is spectacular, covered in glaciers, with old growth forests and mountain lakes on its flanks, as well as stark landscapes that hint at the devastation caused in 1980 by the deadliest and most economically destructive volcanic event in the history of the United States. This eruption killed 57 people, destroyed over 200 homes and kilometers of highways and railroad. The top of St Helens literally blew off, knocking over 400m vertical off the summit of the mountain, leaving behind a crater 3km wide and 800m deep. This explosion sent ash into the stratosphere, and caused the biggest debris avalanche in recorded history, the remnants of which are still very apparent today. The sun was setting over St Helens as we rolled into the parking lot at the trail entrance. The plan was to capitalize on early morning light in the “blast zone” so a dawn start was necessary to make it to the alpine while the light was golden. Morning came too soon. My courtesy wake up call at five am came in the form of Colin shaking the poles of my tent, rousing me out of my slumber. One apple fritter and a few kilometers of singletrack later I began to come to my senses as we rounded a corner and got a full frontal view of St Helens, bathed in pink morning light. The climb up to the blast zone was a gradual singletrack ascent through old growth forest, and finally into the alpine and to our shooting zone. As luck would have it, clouds covered the sun and we proceeded to play the waiting game in order to get some shots. Thankfully the clouds were quick moving and we managed to work the nice light in between the shadows. The trail was fun and loose, comprising generally of tiny pieces of volcanic rock. After a few hours of working the zone, we packed up the camera gear and turned our backs on St Helens, psyched for the descent ahead. We quickly ripped out of the blast zone and back into the stands of old growth timber. 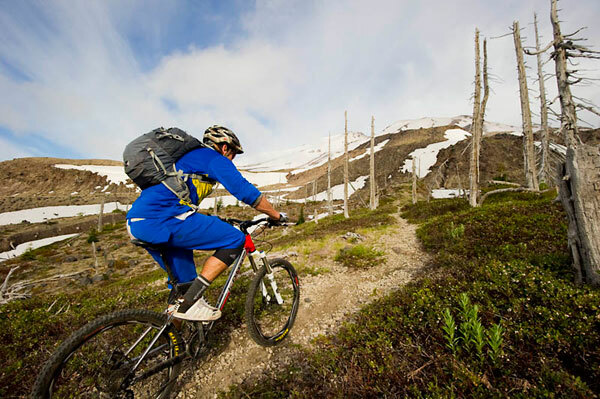 The perfectly buff trail playfully bounced its way down the mountain’s flanks, providing many moments of good times. Eventually we popped out at our campsite, just in time for breakfast. Not a bad way to start the day!